Jody is a tech writer covering productivity, manufacturing, and design. His work has appeared on engineering.com, peer-reviewed journals, and aerospace industry reports. What's an inkjet printer? 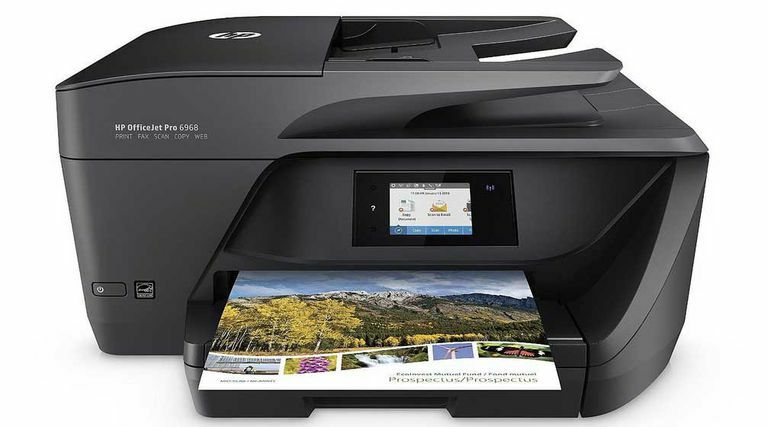 It's any printer that works by propelling droplets of ink, and the most common type of printer for home use. If you print from your computer, smartphone, or digital camera, you probably have an inkjet printer. Most inkjet printers allow color printing of photos and images, as well as black and white documents. An inkjet printer creates an image by firing tiny droplets of ink, hence the inkjet definition. The print head moves back and forth as the paper is fed through a set of rollers. The complete image is built up from many small dots, a bit like the pixels on a TV or phone screen. The quality of an image is determined by the number of dots per inch (DPI), and the range of colors possible. A few different colors of ink can be combined to produce virtually any color. Yellow, red, and cyan ink are the colors most commonly used. These can be combined to make black, although it's usually more economical if a separate black ink is used. Each color may be contained in a separately replaceable cartridge or they may all be contained in a single cartridge. A number of different technologies may be used to propel ink onto the paper. Most consumer printers use the thermal Drop-on-demand (DOD) method. In this process, ink is pumped from a cartridge to a tiny reservoir sitting directly behind a nozzle. A small electric heating element is located in the reservoir. When a pulse of electric current is passed through this element, the solvent in the ink vaporizes, causing an increase in pressure, which propels a drop of ink out of the nozzle. The bubble of vapor then condenses, contracting and drawing some more ink into the reservoir. Some consumer printers, as well as most industrial printers, use a piezoelectric material, instead of a heater. In these devices, a piezoelectric diaphragm, similar to a small speaker, sits at the back of the ink reservoir, opposite the nozzle. The print head contains the nozzle, reservoir, and heater or piezoelectric. In many consumer printers, the print head is part of a disposable ink cartridge, meaning it's replaced whenever new ink is required. In many more expensive printers, a fixed head is used, which is not replaced with the ink cartridges. Other technologies are used in large scale commercial inkjet printers and other industrial devices. These often use a combination of ultrasonic vibration and electrical charge to propel and direct ink droplets in a continuous spray. Such printers may be much faster and use a greater variety of inks and dyes, including those which are solvent-based and ultraviolet curing. This can result in more durable and waterproof prints than can be achieved with consumer printers. Inkjet printing has a very wide range of uses. It's used to print the "best before" dates on food, printing signs and billboards, and even T-shirts. Special methods of inkjet material deposition have even been developed to print solder onto electrical circuit boards, and living cells onto biosensors and biological scaffolds. For most people, though, an inkjet printer is simply a relatively low-cost printer, capable of printing high-quality color photos and black and white documents. They're the most popular choice for home printers, but not so good for heavy use, such as in an office, since they're slower and have higher running costs than laser printers. LED-based printers are typically smaller and they use less power.